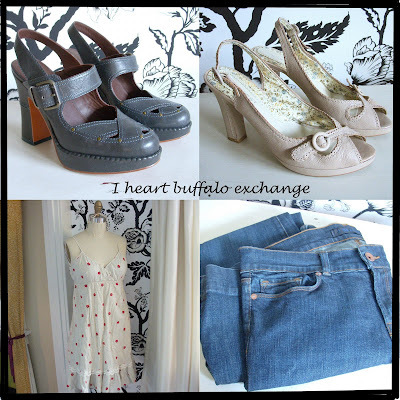 On Saturday I went to my favorite resale store, Buffalo Exchange. Seeing as none of my clothes fit, I needed a few things. Jeans were essential and I found some great dark, flared jeans by J Brand. They need to be hemmed, but they fit perfectly otherwise. I found two fabulous pairs of shoes, which is great because I know they will always fit! My feet went back to their normal size a few weeks after delivery. I found platforms by Frye that look like they have never been worn and some cream strappy pumps by Nine West. My favorite item of the day was the slip dress by Free People, it has the sweetest little red flowers on it. I absolutely adore slip dresses because you can layer them and wear them so many different ways! there are none by me, but i've been to them in AZ and Las Vegas... i had to mail myself all the things i bought! too much to carry on the plane! ♥ the Shoes you found!